There's a fabulous story about the football (soccer בלע"ז) match this week between Israel and Scotland in Glasgow. As the television cameras panned around the crowd at the stadium, viewers caught sight of an elderly rabbi, wrapped up against the cold in a thick coat and scarf, learning from a sefer! 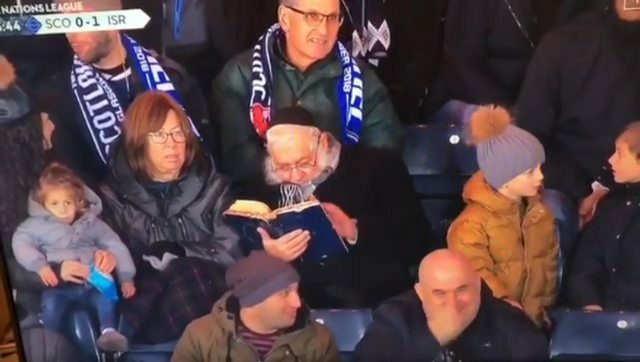 The camera paused on this extraordinary sight, as one of the commentators laments that he missed the goal, and adds that the book must be a good read! The rabbi was none other than Rav Zev Leff of Moshav Mattityahu. He was in Scotland visiting his children, and he took his grandchildren to the football game. It's an extraordinary kiddush Hashem, and a lesson for us, in two ways. But before getting to that, since this forum is about explaining the Rationalist Judaism perspective of Rambam, there is a comment that must be made. In the Forward's charming article on this story, it quotes Rav Leff as saying that "If for one second there would be no one learning Torah anywhere in the world, the world would cease to exist.” This is, of course, common doctrine in the yeshivah world today, and was strongly articulated by R. Chaim of Volozhin. Indeed, for this reason, study shifts in the Volozhin yeshivah were arranged so that there was at least one student learning Torah at every moment of every day and night. The doctrine is presumed to lend credence to the mystical view of Torah study; that it creates the spiritual energy necessary for the world to function. However, although R. Chaim attempts to show that this doctrine is based on classical texts from Chazal, this does not appear to be the case. Careful study reveals that, yet again, we have a situation where a relatively mild view was strengthened over time, infused with mystical meaning, and then read back into earlier sources. I will be discussing this topic in great detail in my forthcoming book Rationalism vs. Mysticism: Schisms in Traditional Rabbinic Thought. For now, I will just give one example. One source, cited by R. Haim of Volozhin, is the tenth-century Midrash of Tanna Devei Eliyahu: "The sages said: Whenever people neglect the Torah, the Holy One seeks to destroy the world" (Tanna Devei Eliyahu Rabba 2). Does this prove R. Chaim's doctrine? First, let us note that it does not say that if people cease studying Torah then the world will be destroyed. Rather, it is a somewhat milder statement that when people neglect Torah (implying something that actually happens from time to time), God seeks to destroy the world (but does not actually do so). The entire discussion here is about people neglecting the observance of Torah, not the study of Torah. Thus, Torah study does not mystically support the existence of the world at every moment. Rather, Torah study is incredibly important for the reasons given by the Rishonim - that it teaches us important concepts, and teaches us how to improve our characters and how to improve society. Now, back the football match. Rav Leff's viral fame is an instructional Kiddush Hashem for two reasons. The obvious one is that it shows how great men use their time for applying their brains for self-improvement, rather than mindlessly watching grown men kick a ball around. Halevay we should all make use of our time so meticulously. But there's also a second lesson here, which Rabbi Yaakov Horowitz pointed out. Clearly, Rav Leff does not have any interest in attending football games, especially not in a cold Scottish winter. And yet he did! He went because, as his daughter explained in an interview, he wanted to spend time with his grandchildren, participating in something that is important to them. As Rabbi Horowitz writes: "If all parents and grandparents had the attitude that spending time with their kids/grandkids is something well worth going outside their own comfort zone, those of us who deal with teens-at-risk would get far less “business” down the road." Indeed! On another note - if on Thanksgiving you're wondering how we can eat turkey, seeing as there is no mesorah for it being a kosher bird, read my article at this link. "it shows how great men use their time for applying their brains for self-improvement, rather than mindlessly watching grown men kick a ball around." "rather than having the temerity to attack the words of R Chaim Volozhiner"
How ironic. Do you know who wrote “It is forbidden for a student to accept the words of his teacher when he has difficulties with them - and sometimes, the truth will lie with the student”? Hey, it could have been worse. R. Slifkin could have described the words of Rav Chaim as a heretical perversion of Judaism... just like the Gedolim did with the words of Rabbeinu Avraham Ben HaRambam. "But before getting to that, since this forum is about explaining the Rationalist Judaism perspective of Rambam, there is a comment that must be made." If someone is frum but neglects to learn Torah he can be said to neglect it. It doesn't have to mean something more dramatic like going off the derech. Who said it has to be dramatic? It could be talking about a frum person who, I don't know, is malbin pnei chaveiro berabbim. Maysim shebechol yom. :). Lo Kashya. Different R Chaim :). Funny, I thought he peeked at the crowd. Like he noticed a change in the crowd or something. There is something so instructive in all the comments attacking you for daring to critique R. Chaim Volozhiner (something which should certainly not be approached lightly, but with great caution and respect. Kind of like exactly what you did.) It really highlights two completely distinct and, I think, mutually exclusive approaches to limud haTorah: are we here to ascertain the correct halacha or hashkafa, and to quote a great man, "Damn the torpedoes, full speed ahead," or are we engaged in a religious ritual which is designed to resemble an intellectual exercise superficially? If we take approach #2, we must certainly not dare to disagree with those who trump us in religious significance. It makes sense in that worldview to say "How can you know better? He lived so long ago, and we respect him so much!" I imagine that you do realize what generally happens to ships that continue full speed ahead in the presence of oncoming torpedoes. might make inspiring heroics during war, but not very good advice for how to live your life. the analogy to the issue under discussion should be obvious. Please elaborate. And explain why all the great Torah scholars, of all time (up until the 21st century, more or less) spent their time (respectfully) critiquing the positions of their elders and betters. This comment is no way an attack on R Leff, part because I am certainly way less than the best parent and also because this clip shows one small part of the game. But, as a general statement, part of going to the game is spending the time with the kids and paying attention to what they are interested in. There is value in "mindlessly watching grown men kick a ball around" when that is what your kids want to you do. I'll say one other thing that I realized over time. I'm interested in intellectual pursuits and I also like sports. Part of me says, but of course, math and Torah are a higher level than sports. But the other part says: "That's because that's what you like to engage in. If others like to listen to music or watch a sporting event, why are you any better". I no longer think that there is a good answer. I'm speaking here of pursuits that give personal pleasure. Of course, pursuits that help others are different, but there, the intellectual person and the practical person seem to have co-equal contributions to make. Pushpin is as good as poetry! Curiosities, not everybody likes talking narishkeit for four hours. Tell me, you will have no problem understanding somebody who needs to make a few important business calls, right! But learn, nah, thats super religiousity right? I work all day and if I can't learn at simchas at night that's the whole day gone without torah. Try to understand other people pov. How do you think a baal hasimha feels looking out at the guests & seeing many of them not taking part in the simha, but learning? How do you think a baal hasimha feels looking out at the guests & seeing many of them not taking part in the simha, but looking at their smartphones, discussing business and politics, or even schmoozing outside? Some people don't like batteling. Get over it. I had the same thoughts. If you're going to spend time with your family, then spend time with your family. And its one thing to take along a sefer to a round table conference , or if you're sitting in a shul for a community function. But to sit ostentatiously like this in the middle of the bleachers, surrounded by spectators - its nothing to be proud of. And I wonder just how much real learning - meaingful learning - he was able to do in that environment. Perhaps Rabbi Zev Leff is able to somehow tune out 80,000 fans, but sure didn't look like it from the clip. And, miracle of miracles, I also agree to an extent with the other part of David Ohsie's comment. Is my reading poetry any more noble than Jim's (e.g.) playing cards, if we both find our enjoyment in different ways? While acknowledging the question, there is a key difference, and that is that a man's identity is bound up by his brain, not his body. Cognito Ergo Sum. Many diversions require skill, but skill does not exercise the brain in the same way (e.g.) art or literature do. The skill is of limited utility; the development of the brain wrought by literature expands the mind universally. With learning torah, there is yet another layer to add to the mix, on top of developing the mind. And that is developing the soul. Let's call that "character building." In theory, learning is supposed to do that. If it does, then it is superior not only to playing cards, but also to intellectual pursuits like art, which only develop the mind. If it doesn't, then chazal already stated long ago that its even worse than other enterprises, and indeed a person is much better off with harmless pastimes. No, you botched the Nefesh Hachaim! He's not bringing the Tanna Devei Eliyahu as a source to his doctrine. When he brings the Tanna Devei Eliyahu he's explicitly talking about a situation where there are people learning Torah just that some people are mevatel Torah. And he says that the world can still exist because of those who are learning, but it loses some vitality because of the sinners who don't learn. AND HE ADDS, THAT BECAUSE OF THE SINNERS, THE WORLD COMES CLOSE TO BEING WORTHY OF DESTRUCTION LIKE IT SAYS IN TANNA DEVEI ELIYOHU THAT WHEN PEOPLE ARE MEVATEL FROM THE TORAH HASHEM SEEKS TO DESTROY THE WORLD (but does not actually do so). Yes, but the sinners he refers to are the sinners who make the bad choice not to learn Torah: "בסבת החטאים האלה בנפשותם". So, based on that source (in part), he is saying that God comes close to destroying the world because some people are not learning Torah, but doesn't actually destroy it because others are learning Torah. If not, the world would be destroyed. I don't understand why R' Slifkin has not yet corrected the post. He wrongly quoted R' Chaim, asked a question based on the misquote, and used this as an example of why R' Chaim is wrong. Seriously? Where's the intellectual honesty? R' Slifkin did not make a mistake. See R' David Ohsie's comment above. Ploni - R' Slifkin did make a mistake. "First, let us note that it does not say that if people cease studying Torah then the world will be destroyed. Rather, it is a somewhat milder statement that when people neglect Torah (implying something that actually happens from time to time), God seeks to destroy the world (but does not actually do so)." With the above words R' Slifkin sought to demonstrate that R' Chaim brought a proof that is not a good proof. This is nonsense if you look at what R' Chaim Volozhiner actually said. In fact R' Chaim Volozhiner said the same exact thing - that G-d seeks to destroy the world but does not actually do so. However, he is discussing when some people don't learn, not when nobody is learning. With all due respect, if R' Slifkin does not correct this clear misquote then his integrity needs to be called into question. No, he didn't make a mistake. R. Chaim says that the reason why, even when people stop learning Torah, the world is not destroyed, is that there are still *other* people learning Torah. I.e., it is Torah study that prevents the world from being destroyed. Ploni - You don't need an inference to show that R Chaim holds Torah study prevents the world from being destroyed. He writes that clearly and unambiguously. I am not trying to say that is not his position. The issue I am taking odds with is about something that R Slifkin claims is a source brought by R Chaim to his doctrine. I demonstrated that R Chaim is not bringing it as a source and therefore R Slifkin's question is a mistake. What do you think R. Chaim is bringing it to prove? Ploni - R' Chaim is bringing it to prove that when some people don't learn Torah Hashem wants to destroy the world, although He doesn't do so because there are still other people learning Torah. Anonymous: Right and the source says nothing about learning Torah vs other Mitzvos and also says nothing about God not destroying the world because some are learning. What is your point? David Ohsie - My point is that the first question R Slifkin asked on R Chaim Volozhiner is not a question at all. It would only be a question if R Chaim would be bringing the Tanna Dvei Eliyohu as a source to the principle that without anyone learning the world would cease to exist. If that was what R Chaim was doing the question would be valid - it doesn't say the world will be destroyed, only that Hashem wants to destroy it. However, R Chaim is not bringing that as a source that the world will cease to exist, rather he is bringing it as a source that the world comes close to being destroyed when some people don't learn Torah - thus the question is nonsense. With all due respect, the fact that the post has not been corrected from this obvious mistake can be attributed to one of two things. Either the author doesn't know how to learn on even the most basic level, or the more likely reason is that he doesn't care about the truth as long as he can promote his agenda. Right, there are absolutely no other conceivable possibilities as to why someone wouldn't accept your criticism. The rest of us are just wondering whether David Ohsie falls into the category of not knowing how to learn on the most basic level, or not caring about the truth. I'm not sure why you brought David Ohsie into this as my criticism was not directed towards him. I stand by what I wrote, however. It's not rocket science. The point I was making regarding the words of R' Chaim Volozhiner is elementary. And until the post is corrected it stands as evidence of shoddy research and a disregard for the truth. "It would only be a question if R Chaim would be bringing the Tanna Dvei Eliyohu as a source to the principle that without anyone learning the world would cease to exist." You also said: "R' Chaim is bringing it to prove that when some people don't learn Torah Hashem wants to destroy the world, although He doesn't do so because there are still other people learning Torah." @Anonymous: If I get your criticism right, you are saying that R Chaim didn't bring that Midrash as proof that the world would be destroyed without learning. That was Sevara D'Nafsheih. So R Slifkin should have said that this is R Chaim's innovation rather than saying it wasn't sourced in the source he gives. I'm not sure that you are right about that, but it leave the fact that R Chaim is using poetic license (which is his right) when he conflates Torah with learning Torah. If his theory is right, then the source (in combination with his personal sevara) would also prove that someone in the world should always be wearing tefillin, davening, doing Chesed, etc at every moment so that the world would not be destroyed. While the actual source you quote clearly indicates you are correct, keep in mind you are arguing with a bar plugs of Reb Chaim Volozhin. "If for one second there would be no one learning Torah anywhere in the world, the world would cease to exist.” This is, of course, common doctrine in the yeshivah world today, and was strongly articulated by R. Chaim of Volozhin." One source, cited by R. Haim of Volozhin....Does this prove R. Chaim's doctrine?" I don't always follow the comments so closely, and I'm traveling at the moment, so I don't have access to all my notes/sources. Also, I feel disinclined to respond to people who are not only too cowardly to use their real names, but who don't even read the comment submission form, which asks people to at least use a pseudonym. Still, I will make an exception here. This part of the blog post is extracted from a longer discussion that I am preparing, in which I go through all R. Chaim's sources, one by one. This source appears as part of a chapter in which he builds up to make his claim that if there was no Torah that was being studied at any moment, the world would cease to exist. The source discussed in the post is at the beginning of the chapter. He says there that if SOME people were to stop learning Torah, God would seek to destroy the world, and the only reason for its continued existence is that there are OTHER people who are learning. As proof for this he cites the Midrash. But there are two problems with this as a prooftext. One is that the Midrash says nothing about the world nevertheless surviving in the merit of other people who are not sinning. If I am incorrect in this analysis, I welcome demonstrations to that effect. However I ask that you read and respect the rules of commenting. Use your real name or a pseudonym (and please stick to the same pseudonym). I am the fellow formerly known as "Anonymous". I will use the name Levi Yitzchok Derbarmdiger from now on. R' Slifkin wrote in his comment: "This source appears as part of a chapter in which he builds up to make his claim that if there was no Torah that was being studied at any moment, the world would cease to exist." The main chapter where he makes his claim about the necessity of Torah study for the world's continued existence is in Chapter 11. The Tanna Dvei Eliyohu is brought in Chapter 25. He brings it to point out that although the world's existence doesn't need everybody to be learning Torah and if even only one person is learning the world can continue to exist, nonetheless when some people are mevatel Torah they detract from the vitality that flows to the world, to the extent that the world comes close to being destroyed. To prove that the world comes close to being destroyed he brings the Tanna Dvei Eliyohu which says that Hashem seeks to destroy the world when people are mevatel Torah. He is not bringing the Tanna Dvei Eliyohu to prove the doctrine which he already established in Chapter 11. In Chapter 11 he brought various proofs to his doctrine. He is bringing it to show that even in a situation where the world will not cease to exist because one or more people are still learning Torah, nonetheless the world comes close to being destroyed when some people are mevatel Torah. Sorry for the delay in responding. You are correct that he does not bring this to make his argument, which he makes earlier in chapter 11. Nevertheless, he does bring it to support his argument. And you are still not addressing two problems. One is that TDE does not refer to a situation where *some* people are neglecting Torah and *other* people are not. Second is that TDE is referring to *observing* Torah, not *learning* Torah. Disappointing, R' Natan, that you felt it necessary to describe enjoyment of a football match as "mindless". Whilst concurring that the results of football matches are not very important in the scheme of things, calling it mindless is an unneccessary insult to those of those of us who do enjoy watching it - as do I. You are welcome to not watch football matches ever. You are welcome to think it is a waste of time. But please refrain from tarring those of us who do enjoy it as mindless. Agree. It's really quite condescending. And if R' Natan has even been to a sports match he would know that most of the spectators are not watching 'mindlessly' but are deeply engaged. It's my impression that the characterization of watching sports as "mindless" is supposed to be a caricature of the yeshivish view of sports and not R. Slifkin's personal opinion. R. Steven, my old friend, please accept my sincere apologies! He meant to say "boring" :). R' Natan - accepted without reservation - as I said in a postlet below, I knew it was not intended as a slur. Hope you are well. In ordinary language if you're told someone is neglecting Judaism or Halacha it means one thing, and neglecting the Torah means another like being told someone is neglecting the Talmud. Each is trying to express something different. A failure to pass down the teachings of Judaism independent of practice is also having the Torah neglected. If for one second there would be no rabbi attending soccer games anywhere in the world, soccer would cease to exist. Reb Chaim Volozhiner sources his point accurately in the words of the zohar. You may think something about the zohar that he did not agree with, but that is the point of difference not this individual issue. As an aside , the nefesh hachaim writes בלתי שום ספק about this very issue. Steven, you're didn't say that enjoyment of football is mindful or a significantly intellectual activity, but even granting such an (unexpressed) argument, it can be described as a mind-wasting activity, certainly for the onlookers who aren't enjoying the advantage of physical activity and health that may come along with football (assuming that is that traumatic brain injuries aren't sustained). If you're convinced of your position (if you have one) why don't you argue and express its merits and why you perceive that "mindlessly watching grown men kick a ball around" is actually a mindfully intellectual activity, or even if mindless that it's an ideal use of time for the average person? Please try to keep arguments to fact and logic and avoid stepping down to the plane of attacking factual or even opinionated statements as being perceived as insulting. This isn't Twitter where people are simply banned for expressing underappreciated facts. Perhaps I should explain further: One can appreciate a football match as a form of undemanding relaxation or one can appreciate it as a fascinating strategic battle where the minds of two managers are engaged in a struggle and we are onlookers to that struggle - or one's level of appreciation could lie somewhere between these two extremes. In any event, even if the word mindless was not intended as a slur ( and knowing R' Natan as I do I am sure that was the case (that it wasn't intended as an insult)) it is a blunt and inacurrate term when applied universally. שמעתי הסברו של הגר"ז לף שליט"א על מה שביקר באצטדיון למשחק כדור רגל עם נכדיו וכו' במדינת סקטולנד יצ"ו (וכפי שנתפרסם בסרטון קצר בכל קצוי תבל). ולולי דבריו הייתי אומר שכיון שהי' הרב שקוע בעמק ההלכה (וכנראה מהסרטון), בספר שב שמעתתא - דבעי צילותא, לא הי' בזה משום חשש ביטול תורה וגם לא משום איסור הישיבה במושב הלצים (וע"ד מאמר הבעש"ט זי"ע "במקום שמחשבתו של אדם שם הוא נמצא"). אבל הגר"ז עצמו יצא לחלק בין אה"ק לחו"ל, שבחו"ל יש מקום להתיר הדבר לפי הנסיבות, שהנוכחים בתחרות כדורגל - ועד"ז בייסבאל - בחו"ל בטהרה הם צופים. והעיד שרבנים חשובים ות"ח מופלגים בארה"ב הופיעו במקומות כאלה, והמפוסרמות אי"צ ראי'. ויש להעיר שכנראה הגרמ"פ זצ"ל החשיב הדבר לאיסור גם בחו"ל. ראה מ"ש בשו"ת אגרות משה (יו"ד ח"ד סי' יא אות א): "באלו שנקראו תיאטרון שעושין שם ענייני שחוק, וכן איצטדיון, שהם המקומות שמשחקין ספארט, לא שייכי בהו עניין ובחוקותיהם לא תלכו . . . אף שהוא דבר אסור מצד איסור ליצנות, וכל ההולך שם עובר באיסור מושב לצים ובביטול תורה - לא רק על זמן זה - אלא שגורם לו להיות בטל לגמרי מתורה . . וכ"ש בתיאטרון הנמצא כעת במדינתנו, וכן האיצטדיון של משחקי ספארט, ואף במדינות אחרות, דעושין זה סתם אינשי מהנכרים שבעיר שלא שייכי כלל לעניני ע"ז . . שוודאי לא שייכי להלאו דובחוקותיהם לא תלכו, אלא הם מאיסור ליצנות וביטול תורה. וגם עוד איסור גדול יש דמגרי יצה"ר של עריות בנפשי' דרובן הם דברי ניבול פה והסתה לעריות". עד כאן לשון ה'אגרות משה'. וראה גם מ"ש בשו"ת משנה הלכות (ח"ו סי' ער), ע"ש בארוכה. ובספר מעלות רבקה עה"ת (להג"ר אהרן יהושע פסין) פ' אחרי מות (עמ' רלה ואילך) האריך, על יסוד דברי האגרות משה, בדבר חומר האיסור, ושיש בזה משום חילול השם, ע"ש בארוכה. ובסוף תשובתו כתב שהראה את דבריו להג"ר יוסף חיים שמרי' קנייבסקי שליט"א שאישר אותם בזה"ל: "הדברים ברורים אין בהם ספק". גם הראה את תשובתו להגר"א הלוי נבנצאל שליט"א שכתב עלי': "דבריו קילורין לעיניים, יישר כוחו". ומדברי כולם מבואר שהאיסור וטעמיו שייכים בכל הארצות, ולא רק באה"ק תובב"א. הרי שדברי הגר"ז לף שליט"א אינם מוסכמים על הכל, ולא באתי אלא להעיר שלא יקבעו בזה הלכה פסוקה לדורות, וכאו"א יעשה כהוראת רבו. He's got to be kidding me. Rav Moshe is not saying that it is always Assur to attend a sporting event. He is saying that the problem with going to a sporting event would be Moshav Leitzim and Bitul Torah, but not Chukas Akum which would mean that one could never go. If it is always assur for that reason, then the whole Teshuvah has no purpose. The point is that those things are an issue they are with any form if entertainment. In addition, Rav Moshe knows that plenty of frum people go to sporting events (and watch them on TV) including B'nei Yeshivah, but doesn't claim here that they are all sinning. Going to a sporting event to spend pleasant time with grandchildren is now Moshav Leitzim and Bittul Torah? Was it Bittul Torah when the C"I went swimming? Also, what's up with the "I showed it to RCK and he agreed". What does that add? Has p'sak become a completely mindless application of words on paper? BTW, from where is he quoting R Leff saying that it is only permitted Chu"l? I have a recording of the Rav speaking after his return to Israel - to Ohr LeGolah or something similar - in which he says this. Happy to forward to you but it is on whatsapp at the moment. Interestingly apropos your previous post, Rav Leff says that he know of many chareidi people who attend sporting events in the US, Bnei Yeshiva and the like.In fact when one of the audience asks "Should a Rav be careful of attending such events in the US?" R' Leff repeats his earlier comment that Bnei Yeshiva have certainly attended such events in the States. @Steven Gaffin. Thanks, I later found the recording. Even his statements about Israel was not that it was Assur. He basically just said that Charedim have a policy of separation from the secular that he follows and since he is Charedi. Rav Leff addresses this exact question himself ,it's on his website . The question number is 389. Am I the only one that doesn't quite understand his chiluk between going to games in chu"l vs going in Israel? Can someone explain it here? He writes כל ההולך שם regarding attending sports events in a stadium. It seems pretty clear to me. On his website he doesn't even say that in Israel it is different. He addressed the Bittul Torah and Moshav Leitzim thing as I said: if you are going to relax, it is OK. This would be the same consideration for any activity. One can easily be מפלפל in all of this, but it would be pointless and foolish. EVERYTHING can be declared forbidden as Bittul Torah, just as everything can be permitted with the justification of ביטולה זה קיומה. Its meaningless. To claim something is "Assur" when it will simply be ignored is itself a violation of כשם שמצוה לומר, וכו'. Did it do anything to raise the prestige of Torah or the rabbinate to claim the Internet was assur? Or did it make it appear to be a חוכא וטלולא? And to bring support from RCK, who everyone knows doesn't devote more than a passing glance to the thousands of visitors and inquiries he receives, is simply sad. I would suggest Chaim Rappaport and Joseph F quietly put that letter back in the drawer. @Joseph F: Just noticed this. You have to understand this in context. He is saying that while the issue of BChukoseihem Lo Teileichu is not relevant, the other things are relevant. You have to ask yourself a few things: 1) what is the point of the Teshuva if it is just to clarify which Issur applies. 2) Rav Moshe knew full well that his own students attended sporting events. 3) As DF points out, any form of entertainment is potentially Bittul Torah. Rav Moshe knew that people are not learning for 24 hours. What he is saying is that there is no absolute Issur, but one should be concerned about these other items. My question for R Slifkin et al is: When R. Slifkin asks "Does this prove R. Chaim's doctrine?" does quoting a singular midrash (10th century Tanna Devei Eliyahu) constitute a proof or an isolated opinion consistent with the thought at hand? Was T' Devei Eliyahu popular? Well received? Influential? Spoke for the majority? Or just an isolated thought? I am confused. Is R. Chaim saying anything more than drush? L'halacha, would we be allowed to desecrate the Shabbat in order to ensure that someone is always learning every second because of the danger to the world? What happened to אין משיבין על הדרש ?